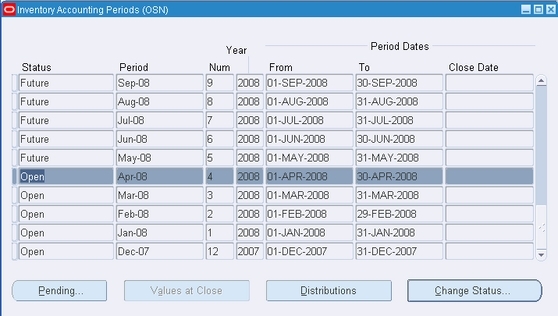 Accounting periods are used in Oracle Inventory to group material and work in process (WIP) transactions for accounting purposes. What is the relevance of these periods? Transactions in Oracle Applications are date-stamped. When we execute a transaction, the transaction date must fall in an open period. If that period is not open then Oracle Inventory prevents us from proceeding any further by displaying the following message. If we have a transaction in Inventory or WIP, or in any other module that falls in an open period then the same period must be open in Oracle General Ledger (GL). This ensures that when closing the period the transaction will be posted correctly. Jennifer, the Inventory Lead at Office Smart Solutions (OSS) needs to conduct some material transactions in the inventory organization called Office Smart Naperville (OSN). OSN was created in an earlier section. As this is the first time, Jennifer needs to specify a First Period for the Inventory Calendar. Since OSN was created in December 2007, she specifies this as the starting period as shown below. 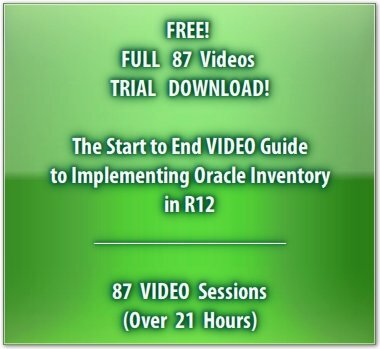 In Oracle Inventory you may have multiple periods open at the same time. However, Oracle Inventory demands that the periods must be opened or closed sequentially. This is what Jennifer does. She is currently in April 2008. So, she opens periods from Dec-07 to Apr-08. Opening inventory periods is an organization-specific exercise. So, Jennifer will have to repeat this task for Office Smart Evansville (OSE) as well. For now, she is good to start performing material transactions in OSN.